This notice is provided on behalf of Highlands Cancer Center (Highlands) This Notice of Privacy Practices describes how we may use and disclose your Protected Health Information to carry out treatment, payment or healthcare operations, and for other purposes permitted or required by law. “Protected Health Information” is information that may identify you and that relates to your past, present, or future physical or mental health, and may include your name, address, phone numbers, and other identifying information. We are required to give you this Notice and to maintain the privacy of your Protected Health Information. We must abide by this Notice, but we reserve the right to change the privacy practices described in it. We understand that medical information about you and your health is personal and confidential, and we are committed to protecting the confidentiality of your medical information. We created a record of the care and services you receive at Highlands. We need this record to provide services to you and to comply with certain legal requirements. WHO WILL FOLLOW THIS NOTICE: This Notice describes the practices of Highlands health-care professionals, employees, volunteers and others who work or provide healthcare services at any Highlands’ facility. You have the right to ask for and obtain a copy of this notice. Inspect or obtain a copy of your records, in paper or electronic form. You may be charged a reasonable fee for the cost of copying, mailing or other supplies. We are allowed to deny this request under certain circumstances. In some situations, you have the right to have the denial of your request reviewed by a licensed healthcare professional identified by HOG who was not involved in the original denial decision. We will comply with the outcome of this review. If you feel the information is incomplete or incorrect. We are allowed to deny this request in certain circumstances and may ask you to put these requests in writing and provide a reason that supports your request. We are not required to agree to the requested restrictions, unless you are requesting to restrict certain information from your health plan and you have paid for your HOG services in full. Request Hightlands not to use or share certain health information for treatment, payment, or our operations. We are not required to agree to your request and the request may be denied if would affect your care. If you pay for a service or health care item out-of-pocket in full, you can ask HOG not to share that information for the purpose of your payment or our operation with your health insurer. We will comply with the request unless a law requires us to share that information. You have the right to obtain a record of the disclosures of your Protected Health Information. Sent to you by alternative means or at alternative locations. Provide us with written permission for uses and disclosures of your Protected Health Information that are not covered by the Notice or permitted by law. Except to the extent that the use or disclosure has already occured, you may cancel this permission. This request to cancel must be put in writing. You have the right to submit any written requests to inspect, copy, or amend your records to the medical records department. For marketing purposes, sale of your information or psychotherapy notes. You have the right to “opt out” of receiving communications regarding fundraising. Highlands will use your Protected Health Information for treatment. Certain information obtained by a nurse, doctor, therapist, or other healthcare worker will be put into your record and used to plan and manage your treatment. We may provide reports or other information to your doctor or other authorized persons who are involved in your care. A bill will be sent to you and/or your insurance company with information about your diagnosis, procedures and supplies used. We may also disclose limited information about your bill to others, such as a collection agency, to obtain payment. HOG may use and share your health information to run our practice, improve quality of care, and contact you when necessary. Patient telephone calls may be recorded for quality assurance purposes. We may share some of your Protected Health Information with outside people or companies who provide services for us. 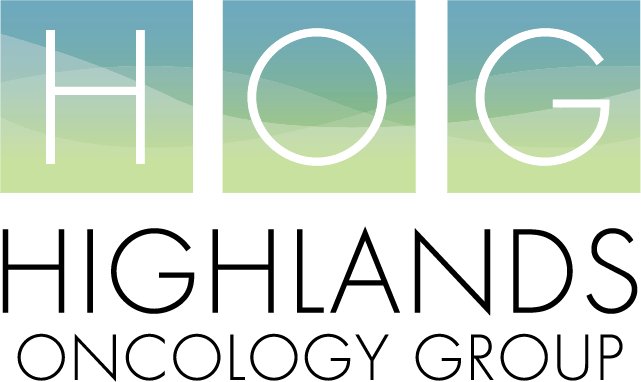 Highlands may use or disclose your Protected Health Information to notify a family member or other person involved in your care, your location and general condition unless you tell us not to do so. Your Protected Health Information may be used for research purposes in certain circumstances with your permission, or after we receive approval from a special review board whose members review and approve the research project. In the event of your death, we may disclose your Protected Health Information to these people, to the extent allowed by law, so that they may carry out their duties. We may share your Protected Health Information with the organ donation agency for the purpose of tissue or organ donation in certain circumstances and as required by law. Highlands Cancer Center will contact you by telephone, email, or by texting you, to remind you of your scheduled appointments. If you do not wish to have these reminders sent to you using these methosds, please contact the receptionist. We may disclose your Protected Health Information for workers’ compensation claims. Highlands Cancer Center may disclose medical information about you for public health activities such as control of disease, injury, or disability, reporting of births and deaths, reporting of child abuse or neglect, reporting of medication adverse events, and in situations related to defective medical products. If you are an inmate of a correctional institution, we may disclose your Personal Health Information to the institution or law enforcement as needed for your health or the health and safety of others. We must disclose your Protected Health Information for law enforcement purposes as required by law. We must disclose your Protected Health Information to a health oversight agency for activites authorized by law, such as investigations and inspections. Oversight agencies are those that oversee the healthcare system, government benefit programs, such as Medicaid, and other government regulatory programs. We may disclose your Protected Health Information in the course of any judicial or administrative proceeding or in response to a court order, subpoena, discovery request or other lawful process, as allowed by law. We must make disclosures when required by the Secretary of the Department of Health and Human Services to investigate or determine our compliance with the HIPAA Privacy Regulations. Highlands Cancer Center may disclose medical information to federal officials for intelligence and other national security activities as required by law. In certain situations, we may disclose Protected Health Information of military personnel and veterans. We may disclose your Protected Health Information for national security activities required by law. For certain health information, you can tell us choices about what we share. If you have a clear preference for how we share your information in the situation described below, share your preference with Highlands. With your family, close or personal friend, or any other person identified by you involved in your care. In a disaster relief situation. If you are not able to tell us your preference, we may share information if we believe it is in your best interest. We may also share your information whenneeded to lessen a serious and imminent threat to health and safety.